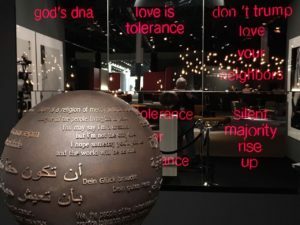 The Globe of Tolerance is an art project by Hubertus Hoffmann. 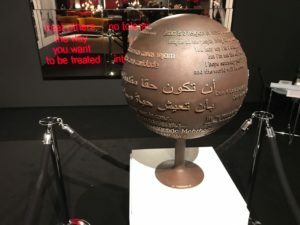 The globe, made in bronze or metal, shows several quotes from prominent Champions of Tolerance in many languages. 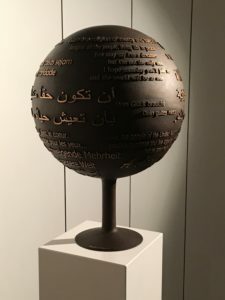 The Globe is a global symbol of tolerance and respect, representing the long road towards tolerance of other religions, ethnic minorities and races, and showing the global consensus of humanity. 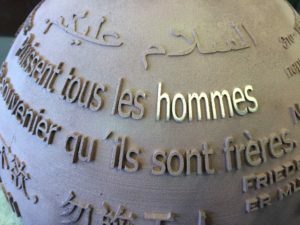 The quotes in nine different languages include Nelson Mandela, Pope John II, Sheikh Zayed, Confucius, Hillel The Elder, King Frederick The Great, Immanuel Kant, Voltaire and John Lennon. Do not do to others, what you do not want others do to you. What you do not wish for yourself, do not to other people. From Sheikh Zayed, the Founding Father of the United Arab Emirates (UAE). 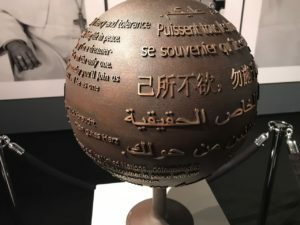 Quotes from website of the UAE Embassy in Washington DC and Zaki Nusseibeh, Abu Dhabi. إن المعيار الوحيد الصالح للحكم على استحقاقات المرء هي، بغض النظر عن إيمانه، أعماله الصالحة. The only valid criterion for judging man’s merit, regardless of his faith, is his good actions. أن تكون حقاً متديناً يعني أن تمارس تعاليم إيمانك الخاص الحقيقية بأن تعيش حياةً صالحةً تجلب الفرح والهناء والسلام للذين من حولك. Being truly religious means fulfilling the true message of your own faith by leading a moral and good life that brings joy, comfort and peace to those around you. May all people remember, that they are brothers. Everybody should life according to his fashion. All you do, do with love. Это – универсальный закон: нетерпимость – первый признак не соответсвующего образования. Плохо образованный человек ведет себя с высокомерным нетерпением, тогда как действительно глубокое образование порождает смирение. Image all the people, living life in peace. And the world be as one. We the people of the United Nations…determined to practise tolerance and live together in peace with one another as good neighbors. No one is born hating another person because oft he colour of his skin, or his background, or his religion. People must learn to hate. If they can learn to hate, they can be taught to love, for love comes more naturally to the heart than ist opposite. Islam is a religion of mercy and tolerance. Najkrótsza droga do Boga, to inny człowiek. The shortest way to God is your other human being. Friede ist kein Naturzustand- er muss gestiftet werden. Peace is not the natural state, it must be established. 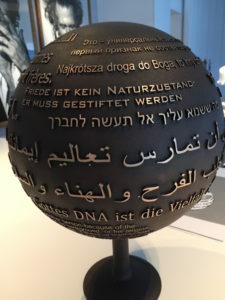 Gottes DNA ist die Vielfalt. Steh auf, Du schweigende Mehrheit: für eine bessere Welt. 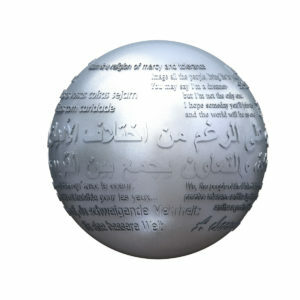 If you want to support The Global Tolerance Initiative and buy a globe, please write our team at info@loveistolerance.com. add to his unique individual bronze globe of tolerance.